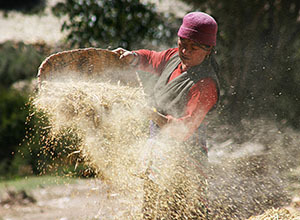 A woman harvests buckwheat in Geling, Nepal. Agricultural interventions are increasingly being integrated into health and nutrition programs and expected to contribute to improved health and nutrition. As a result, there is greater need for evidence and guidance on potential synergies between and across these sectors, especially in terms of what mix of actions can best support priority outcomes under each. The range and types of proven research methods used for agriculture are and have been quite separate from those used for health and nutrition. However, the geographic scale and socioeconomic nature of multisectoral interventions now requires integration of these previously separate research methods. In this webinar Tufts University's Will Masters discussed a typology of interventions and metrics that builds on his work with the Nutrition Innovation Lab, helping to inform the design of future multi­sector interventions. In 2013 researchers applied this metric of integration in an internal review of 17 projects implemented by Catholic Relief Services (CRS) across Africa, Asia, and Latin America. Senior Technical Advisor Valerie Rhoe­ Davis discussed the results of the pilot test. The CRS ­specific causal framework developed for the pilot is now being used as a tool for strengthening CRS staff knowledge and skills to identify clear links and gaps in programs aiming to integrate nutrition with agriculture.